Canadian Family Pharmacy is just another online pharmacy scam. 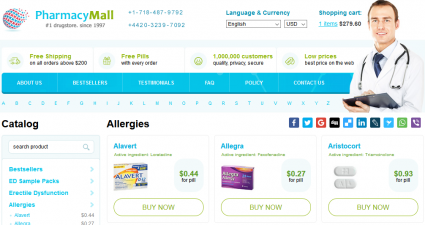 The website address is canadian-familypharmacy.com and it looks exactly like a typical online pharmacy with an organized list of products separated into categories. It also claims to be FDA approved. 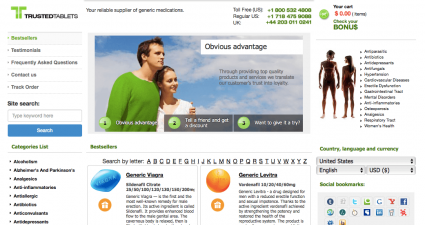 The images, design, layout and content could fool anyone into thinking it’s a standard online pharmacy. The canadian-familypharmacy.com website claims that it is an SSL secured website, but it is not. It makes many other false claims throughout the website. A quick Google search provided multiple results with the same name, Canadian Family Pharmacy, at several different web addresses with spamming & scamming intentions. Don’t be fooled by the website appearance. Take a deeper look into its operations. We urge our readers to recognize the fraudulent intentions of canadian-familypharmacy.com. Online pharmacy websites like this pose a threat to the safety and security of consumer’s health, as well as their finances. Continue reading for more evidence of canadian-familypharmacy.com’s suspicious activity. ScamAdviser points out that the website canadian-familypharmacy.com has been listed as a threat. Although the Canadian Family Pharmacy claims to be from Canada, the website location is in the United States. Due to this, the site has a higher than expected safety rating, but consumers should still exercise extreme caution. The pharmacy is not part of the member database of the Canadian International Pharmacy Association (CIPA). Claiming to be a Canadian pharmacy, it is even a bigger surprise that it is not a member of CIPA. 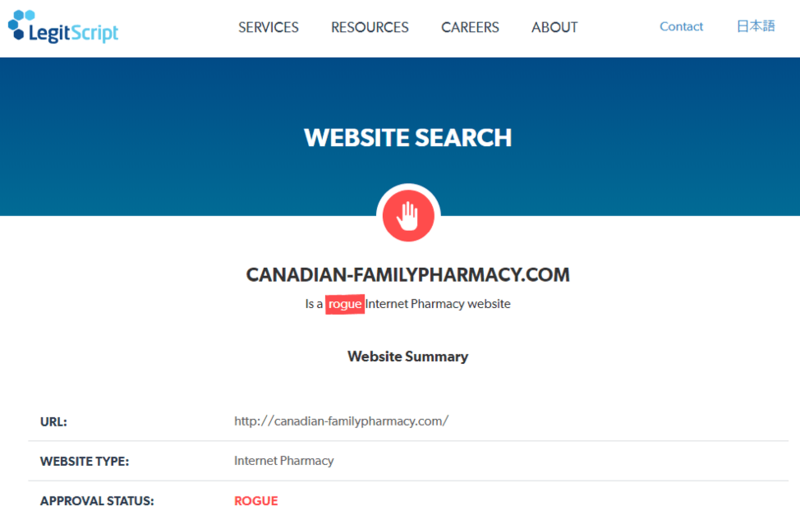 CIPA gives the Canadian Family Pharmacy an “invalid” status and places it in the database for “Rogue Online Pharmacies and Fake Mailorder Prescription Websites”. It states that the website canadian-familypharmacy.com should not be trusted and urges consumers to avoid contacting them. LegitScript recognizes canadian-familypharmacy.com as a “Rogue Internet Pharmacy Website”. The report further details that the online pharmaceutical service fails to demonstrate any credibility or legality. Its apparent fraudulent and harmful objectives result in stern disapproval by LegitScript. Its service, products and associated business practices breach all regulatory and/or compliance to medicinal standards. Client reviews or testimonials are designed to help consumers understand existing customer’s experiences, so they can make informed decisions. But they can also be used to manipulate new consumers into believing something that is likely untrue. In the case of canadian-familypharmacy.com, there is a customer testimonials section, but it is filled with only 5-star reviews, many of which are from the same date. So, the legitimacy of the reviews is highly doubtful. An independent review site, MyWOT classifies this site as spam & provides a link indicating it has been shut down by the US government. This is a huge red flag, to say the least! Trustpilot is another independent review service that has absolutely no record of canadian-familypharmacy.com. This is more than likely due to the fact that it is not a legitimate business. Trustpilot encourages businesses to connect with their potential customers through their website, and business owners will almost always claim their business, but Canadian Family Pharmacy remains unclaimed by its owners and has a zero star rating. MyWOT gives canadian-familypharmacy.com an “unknown” safety rating. The reputation rating for the Canadian Family Pharmacy is a dismal 0.1 stars out of the maximum of 5 stars. It is also categorized as a probable spamming or scamming website. The trustworthiness rating for the website is 2 out of 100 and the child safety rating is 1 out of 100. The website canadian-familypharmacy.com receives a disgraceful scorecard that will further hurt its reputation as an online pharmacy. 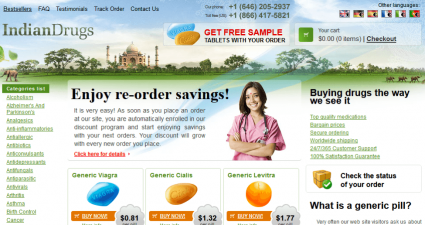 The website canadian-familypharmacy.com is an organized website that offers hefty discounts on generic and brand pills to attract consumers. The more pills you order, the more you save. Large orders can receive free delivery and even extra pills. 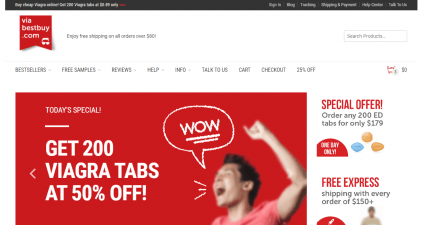 This foolproof strategy tricks innocent shoppers into completing the online sale with a false sense of security. The Canadian Family Pharmacy is a fraudulent Internet pharmacy business available at the domain canadian-familypharmacy.com and a few other domains, as well. It is a rogue site designed to cheat consumers of their money, trust and confidential information. We urge readers to be aware and avoid this website and its services to save themselves from credit card fraud and other potential losses. Our comprehensive review of canadian-familypharmacy.com did not result in anything positive, so we award it only 1 star.